Doors with sidelights add a whole new character to the front of a house. They can be ordered as a unit or they can come separately. It is recommended that the unit be ordered with the sidelights as a part of the unit. Follow these steps for installation. Remove the door from the frame at the hinges by tapping the bottom of the hinge-pin with the hammer and nail set. Set the door aside for now. Set the jamb with sidelights into the entryway opening in the house. If the product is a split jamb, separate the parts and slip one in the entryway opening in the house. Center the jamb in the opening and place the door shims between the jamb and the studs in the wall. Drive the nail through the pre-drilled holes in the jamb, the shim and into the stud. Secure the jamb in one spot first to hold it in place. Plumb the jamb with the level and secure the jamb by inserting another door shim on the same side of the jamb as in Step 3. Drive the nail through the pre-drilled holes in the jamb, the shim and into the stud. Put the level on the top of the jamb to be certain it is straight and square with the plumbed side. Secure the top of the jamb in the same manner as in Step 4. 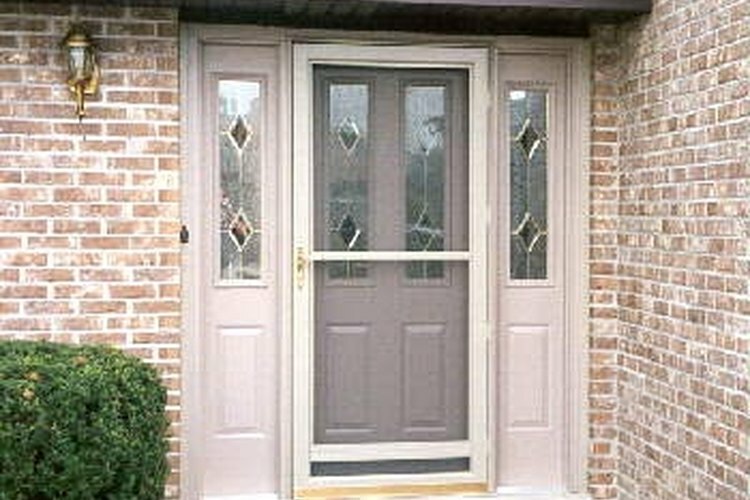 Replace the door on its hinge and install the door hardware. Pre-drill the holes in the jamb for tacking the jamb in place before you set it in the opening. Secure the threshold of the unit with the appropriate fasteners. Screws for wood flooring, concrete screws for concrete floors. Do not attempt to lift the door unit by yourself.